Jeff Gossmann traveled over 1,400 miles to pursue a degree at Regent University. 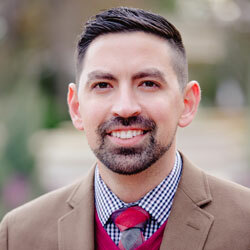 Now the former resident of Temple, Texas, is seeking to lead students closer to Christ as the newly appointed assistant director of campus ministries. Before moving to Virginia, Gossmann and his wife Kelli were serving in college ministry and as worship leaders. Gossmann said that in 2014, God “reignited” a dream of his to teach as a professor. After praying and receiving confirmation, Gossmann and his wife, as well as their four children — all under the age of 10 — trekked across the country and set their roots down in Virginia Beach, Virginia. Here, Gossmann began working on his M.Div. at Regent’s School of Divinity. The next year, Gossmann began teaching as an adjunct professor of Biblical studies at Wave Leadership College. Two years later, in May of 2017, Gossmann graduated from Regent’s School of Divinity. That same year, he was brought on to lead in his role in campus ministries. Regent, he said, is a place that encourages students to grow as leaders and Christians, which begins on a relational level. College, he said, is a pivotal time, one in which students undergo immense change. Going to LifeGroup, attending University Chapel and Unchapel, and finding a local church, are all ways students can grow in their faith and engage their community. “I’m hoping that campus ministries can kind of walk alongside them so that they own their faith for themselves so that they buy in that God’s calling them to be a witness in the world and effect positive change … bring the Kingdom of God in their own sphere of influence,” he added. True community, said Gossmann, is found when people support one another, love one another, and actively seek relationship with one another. It’s “knowing people and being known and being appreciated and being celebrated,” said Gossman. And it’s in and from this community, one centered on Christ and celebrating the gifts he places within his people, that “God’s will becomes enacted in our relationships,” he said. Gossmannn explained that the “expressions of Christianity” the apostle Paul wrote about — being kind, gentle, hospitable, forgiving, merciful — can only truly be carried out when believers engage in community.